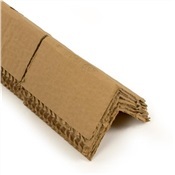 3" X 3" X 30 1/8"
Corner pallet protectors provide a great cost effective way to secure valuable shipments and avoid costly damages. The stabalizing nature of these protectors keeps merchandise from shifting during shipping, and movement around the warehouse. Customers use the corner-boards to protect items on a wide variety of items ranging from appliances to fruit. Not only will they improve the appearance of your shipments they will significantly reduce damages and claims if used correctly. Sold in large lots and pallet quantities and shipped via common carrier. Size:3" x 3" x 30 1/8"
3" x 3" x 66 1/8"
2" x 2" x 29.75"
2" x 2" x 4 5 5/16"
2" x 2" x 46"
3" x 3" x 12 3/8"
3" x 3" x 12 1/2"
3" x 3" x 12 5/8"
3" x 3" x 12 3/4"
3" x 3" x 12 7/8"
3" X 3" X 54"
3" X 3" X 48 1/8"
3" X 3" X 33 7/8"
3" X 3" X 55"
3" X 3" X 19.5"
3" X 3" X 16.125"
3" X 3" X 17.125"
3" X 3" X 19.625"
3" X 3" X 21 3/4"
3" X 3" X 19.25"
3" X 3" X 20.125"
3" X 3" X 20.375"
3" X 3" X 22"
3" X 3" X 16.25"
3" X 3" X 17.625"
3" X 3" X 23 1/2"
3" X 3" X 17.25"
3" X 3" X 17.875"
3" X 3" X 18.375"
3" X 3" X 22 1/8"
3" X 3" X 34"